After James Bradley’s ‘Scary Monsters (and Super Creeps)’. David Bowie was really the first artist I found on my own as a young adult. Bowie came to me in a humorous, intertextual way, through watching Zoolander at the age of about 16 at Birch, Carroll & Coyle Cinemas, Coffs Harbour. I worked there so movies were only 50 cents, and I must have seen Zoolander about four times. Some of you may remember the moment where Bowie shows up, to call the ‘walk-off’. When the legend steps into frame, just a small section from ‘Let’s Dance’, plays: ‘Let’s dance… duh, duh duh duhduh’. Well this refrain haunted me. I found myself sitting in class, trying to concentrate on Othello and ‘duh, duh duh duhduh’ would repeat, over and over. I knew this song, from one of my favourite teenage movies Gia, starring Angelina Jolie as the tragic, bisexual, gorgeous and wild ‘original supermodel’ Gia Carangi. I’d liked the song watching the film when I was 14, 15, 16 – but now, it was absolutely glued in my head. 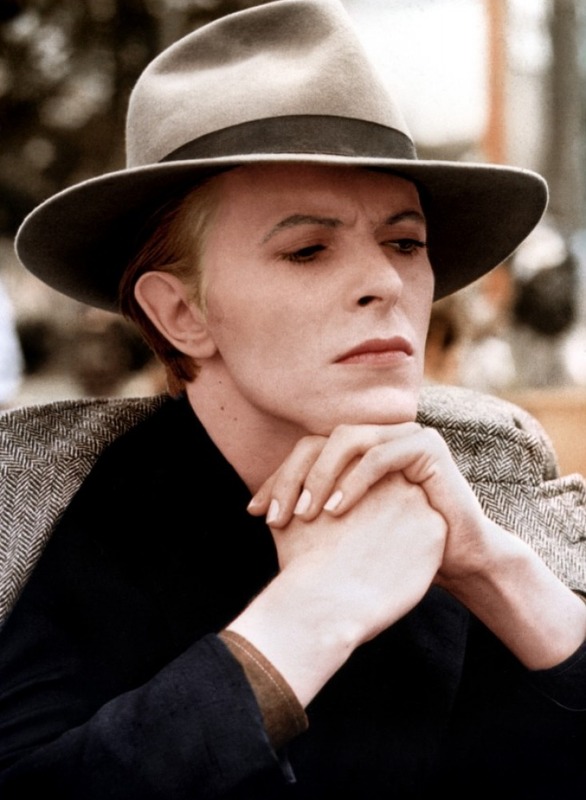 I also remembered reading, in the biography of Gia (Thing of Beauty by Stephen Fried), about her being a ‘Bowie kid’ in the ’70s, and I remembered the fact of his open sexuality – this being a big thing that attracted me to cultural icons in my teens as I was struggling with being open about my own attractions. But it was the song itself – that tiny part, which began the obsession. The first CD I bought was ChangesBowie, a best-of, which of course included ‘Let’s Dance’. It features magic from all eras (‘Space Oddity’ through ‘Blue Jean’). I recognised many of the songs though never knew they’d been by the same person. My parents had the Pretty Woman soundtrack when I was a kid, and there on ChangesBowie was ‘Fame ‘90’! Those-in-the-know started to recommend albums, the first being Hunky Dory – and I fell in love with the song ‘Life on Mars’ and, being an Andy Warhol fan, dug the song about him: ‘I’d like to be a gallery/Put you all inside my show’. For my seventeenth birthday my good friend Simon bought me the Best of Bowie DVD: two discs of his incredible film clips (now my most-watched DVD). I was fascinated by the weird, druggy, soft-focus post-modern direction of David Mallet, who did many of his film clips. 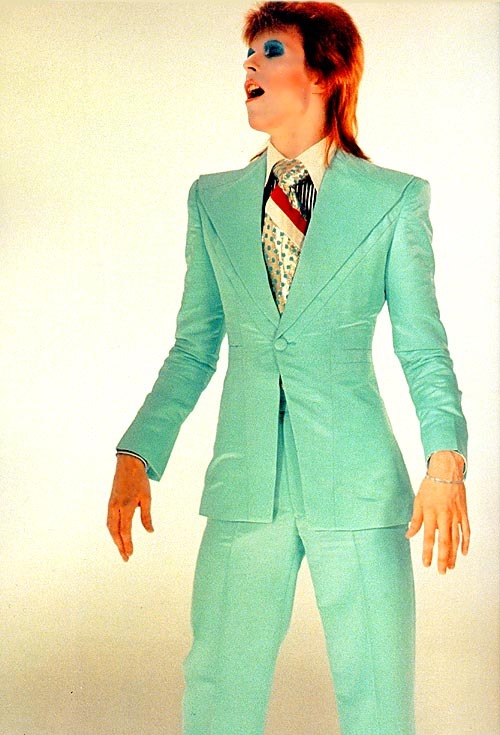 I was inspired by the transgressive, chameleonic appearance of Bowie – his camera-flirt face, his bony hips in tight circuit-patterned jumpsuits, his ‘coolness’, his glamour, his paleness, his sadness, his out-of-itness (the hilarious ‘DJ’ clip), his regret, his silliness (‘Dancing in the Street’ with Mick Jagger, his evolution (jazz, synth, metal, hip hop, techno – see ‘The Heart’s Filthy Lesson’ or ‘Hallo Spaceboy’). He’s always new. He’s the artist you never get sick of because you just go through moods with him – the different albums, the different eras, the different styles – and this through-line of drama, emotional complexity, and other-worldliness (fighting the constraints of this world). Although my parents had listened to Bowie when they were young, he wasn’t someone they listened to when we were growing up. Bowie belonged to a certain set of memories and emotions, particularly for my Dad, who was in his teens and early 20s in the 1970s. In the early days of my Bowie discovery, I sat down with my dad and played Hunky Dory. ‘Space Oddity’ is a great song, my dad said. When it came on, he cried, and I hugged him. It was a song that had made me cry, too, in the privacy of my room, but I wasn’t sure why. ‘Planet Earth is blue and there’s nothing we can do’. For my dad, it brought back a specific time and place, and was also a reminder of the time that had passed since then, I’d imagine. For all the joy of that night, Bowie and I have shared some dark times. Because, really, he spoke to a part of me that not a lot of people around me saw, or wanted to see – or, I wouldn’t let them see. Wouldn’t, y’no, ‘burden’ them. I’m sure my teenage problems aren’t any more special than anyone else’s, but at the time I felt alone, and often: alone, swallowed, at the end of the world. I have the greatest family and friends, there were no visible problems, no causes. My dad was sick, and that was hard, but it wasn’t that, the word ‘overwhelmed’ came into my mind a lot. Everything required so much effort. Being, living, making something of it all, knowing the things you can never change, knowing that when you’re happy that moment will end, etc. I was extra-sensitive and kinda shocked by reality. And Bowie was one of my saviours, a space blanket, an inspiration. He told me I could be creative and open and eccentric and do big things and that it would be okay if, on some level, this feeling remained. There is one more major role Bowie has played so far in my life – one of connection. When I lived in Coffs Harbour I’d try and put on Bowie at a party, and be practically booed from the room. They didn’t want Bowie, or Pink Floyd, or the Doors, or even Elton John. My stupid old sad music, my ‘bring down’. Don’t get me wrong, I like to dance, too. I love it, actually. But just once, I wanted them to listen, and appreciate (and connect). My mates. Some did appreciate him in private, but there was this type of person you always had to become in a party context – and there is that in me – but some part always felt thwarted. I still feel sad when I think of some of those nights – On my nineteenth birthday I was desperately unhappy. Hardly anyone came to my birthday, I watched a video the next day of my drunk-on-Schnapps self watching a music DVD, despised what I saw, and over the next year I lost over 20 kilos becoming what I thought I should be. But now, oh, Melbourne! I can play Bowie to my heart’s content. My friends like Bowie. They also like jazz, and musicals, and sad country music, and Nick Cave, and Fleetwood Mac, and then even that stuff you can dance to. About two years after I’d moved to Melbourne, I was spending the afternoon with one of my best friends at ACMI, sipping red wine, and we had a conversation about life, the universe and everything, then he went off to a movie and I went home to watch Rocky Horror and Stingray Sam. We texted each other all though our movies (pictures of round faces and corsets) and afterwards I asked G what he was up to. ‘Just walking around the city, looking at the stars’, he said. I invited him over to hang out, we’d been hanging out more and more lately and I was jittery and yet ecstatic about what was possibly growing. After all, he was the best person I knew. When he arrived, we watched my whole David Bowie DVD, both discs, and I thought – how wonderful it is to find someone who loves this like I do. At the end of the DVD, Bowie shot his Cupid arrow and our hands, so naturally, came together. I’ve been watching BBC’s Life on Mars. Your Bowie is the music playing as Tyler goes from 2006 to 1973. Quite the generation-bridger, your Dave. Thank you, that was a great read. I always loved Bowie’s work but didn’t really get floored by his music until “Outside” was released, especially “Hallo Spaceboy”. Then going back it all somehow made a bigger impact. Given they were the support act when he toured, I also have Bowie to thank for my introduction to Something For Kate. A terrific account Angela, with a very romantic ending! Interesting that you share your first name with Bowie’s first wife: should be call you Angie? Bowie was very important to my own teenage years, but that was the period of “Station to Station”, “Low”, and “Heroes” (I won a copy of the LP of the latter on a radio competition, when it was first released). I later came to know his earlier releases and personas. If I recall correctly I wore out my LPs of the concert albums “David Live” and “Stage”. I think I related to Bowie’s otherworldly/alien persona, which reached its apogee in “The Man Who Fell to Earth”. In the 80s and 90s I lost touch with Bowie’s music until I saw the video of “Thursday’s Child” from “Hours…”. Since then I’ve reconnected with his music and collected almost all his CDs and DVDs. I’m currently waiting from my pre-ordered copy of the new “Station to Station” 3-CD set. He’s a remarkable artist and performer. Bowie is awesome. Has been forever. I took my son to see him in Brisbane a few years ago. Hate to count how fast the years go… anyhow at the hotel we stayed in the manager sympathised with my son for having to go to the concert. My son is a huge Bowie fan too… so he set the record straight. There was no coersion. Proves Bowie appeals to more than one generation. If I had heard you playing Bowie in Coffs… I would have asked you to turn it up!!! TS – yes, Something for Kate were great support for the Reality Tour. Kev – thanks for sharing 🙂 And you can definitely call me Angie. Some of my friends do. You’re getting the special edition Station to Station? That’s going to be amazing. I didn;t even mention ‘Thursday’s Child’ – a beautiful song. Dragonmuse – Thanks for your comment! Glad your son set the record straight. I saw a few parent/child combos at the concert I was at – having a great time! 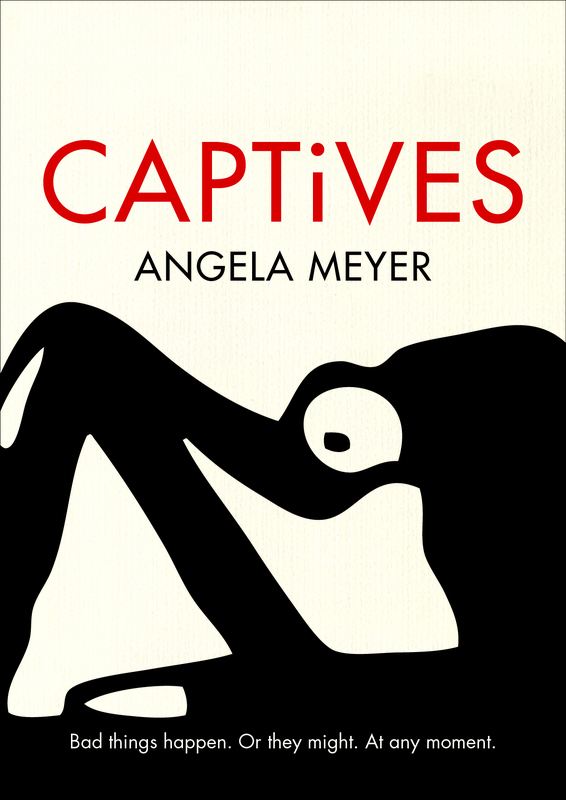 Gorgeous piece Angela. Love your evocation of that uncanny teenage nostalgia. Must go download some Bowie now! Nice article – “Life on Mars” has long been my favourite track – not much wrong with “Jean Genie” as a dance track. Aladdin Sane is probably my favourite Bowie album. I haven’t played any Bowie for ages not sure why but will load some on to my player. Thanks for reminding me how good he is. 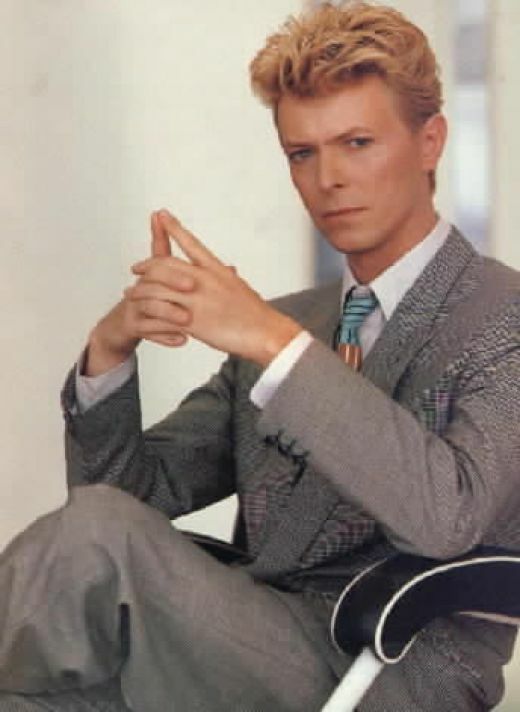 Ah, the Thin White Duke. Ageless, timeless and fabulous. One of my all time favourites, although I do think his prowess as a songwriter especially began to wane after The Serious Moonlight years. Hunky Dory is his finest album. Considering it came out in 1971 or thereabouts, it is still one of the most innovative and versatile examples of modern music. Thanks, Angela. Great story! Ziggy remains my favourite ever cd by a solo artist. Did you catch DB in Ricky Gervais’s Extras? Shows a great comedy touch as well. Hi John – I’ve been growing more and more fond of Aladdin Sane, wonderful album. Dez – it certainly is. Thanks for your comment.